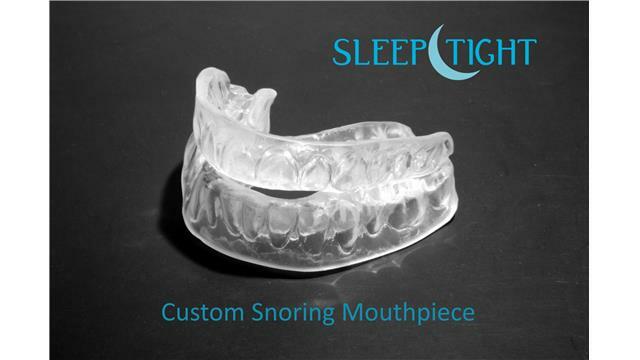 •	The simple to use SleepTight Custom Snoring Mouthpiece kit can save you time and costly dental visits. This custom dental device is fabricated in a dental laboratory just like those from a dentist. •	For the best in comfort, fit and durability, the professional grade SleepTight Custom could be the solution for both you and your sleep partner. •	The SleepTight Custom incorporates the unique TMP (Trial Mouthpiece Technology) to assure you of a successful result right away even for first time snoring mouthpiece users. •	Use the Trial Mouthpiece to verify snoring improvement, make your own dental impressions and send to the dental laboratory in the pre-paid mailer. Who should use the SleepTight Custom? •	If you have used other snoring mouthpieces and had problems with the bulk of the device, or the appliance was not retentive, or was just not comfortable; then upgrade to the SleepTight Custom. •	For first time mouthpiece users, the TMP lets you “test drive” and go directly to a better mouthpiece solution for your snoring problem. •	The SleepTight Custom is fabricated in a certified dental laboratory under the supervision of a US licensed dentist. Make your own dental impression at home, send it to the dental lab and get your own custom stop snoring mouthpiece. The SleepTight Custom offers you the best in fit comfort and durability. Follow the easy to use steps and instructions provided in your kit and in no time, you and your sleep partner we’ll enjoy the best sleep of your lives. This Trial Mouthpiece (TMP) is used to make sure your snoring improves before you make the final impression. The TMP is an actual stop snoring mouthpiece which you fit yourself to verify that the snoring stops. Fitting directions are provided with the kit. Only after you have concluded that your snoring has improved with the TMP, should you proceed to the impression stage. Fit 2 impression trays by softening in water. Make two dental impressions, one of each set of teeth as described in the provided directions. Place the dental impressions into the prepaid shipping bag and mail to the dental laboratory. Most US customers receive their SleepTight Custom in less than three weeks. You must include your shipping address. Use and care information is included with the kit. Use of the TMP to improve your snoring will assure success of the SleepTight Custom. DO NOT proceed to the impression stage if you do not see snoring improvement with the TMP. If you do not see improvement with the trial mouthpiece, contact us via email at info@sleeptightmouthpiece.com for help. A refund can be issued for the purchase less shipping costs, if the all unused materials are returned in original packaging within 60 days of purchase. The purchaser is responsible for return shipping costs. No refunds are available once the impression is shipped to the lab. These mouthpieces are manufactured with FDA approved materials commonly used for mouthguards and various surgical applications. The SleepTight appliances are intended to primarily treat snoring and may be used to treat obstructive sleep apnea under medical supervision. To optimize success, you should read and follow all directions and safety instructions carefully before using the boil and bite fitting process. Check to make sure it is not too hot before placing in your mouth. The manufacturer cannot directly oversee the fitting process and as such the user assumes all the risks and liabilities. Do not store it near any heated surface, chew on the mouthpiece and keep away from pets. The QNZ mouthpieces are fabricated from FDA approved surgical materials, ethylene vinyl acetate. The user understands that optimal performance of these products may require medical or dental supervision. The adult user of these devices has or will read and comply with all product descriptions, directions, warnings, packing information, user agreements and other information supplied to user or available from this website regarding application and use of this device. The adult user of this device will truthfully complete the any required health screening questionnaire and seek appropriate medical or dental assistance as prescribed or suggested.